Last week, NASA unveiled the highest-resolution photograph of Earth ever taken... or, rather, the highest-resolution photograph of half the Earth. 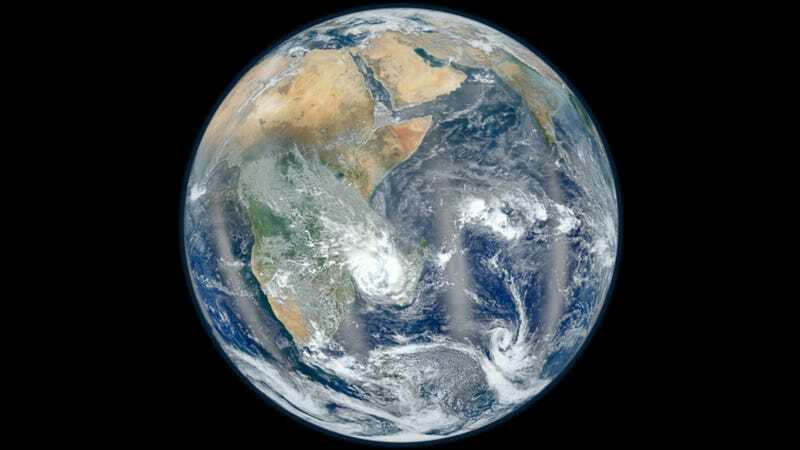 Here, in response to an outpouring of public demand, is the most detailed image ever released of the planet's oft-neglected Eastern Hemisphere — a high-resolution companion-image that completes the update to the original "Blue Marble" photographs. According to NASA, this new image — like its Western counterpart — is a composite image, meaning it actually comprises a number of separate photographs taken over the course of several orbits made on January 23 (a massively high-resolution version is available here). This particular picture is made up of six images, captured by the Visible Infrared Imaging Radiometer Suite (VIIRS) onboard the Agency's new Suomi NPP satellite. This figure shows how VIIRS acquired the imaging data necessary to produce a color image of each swath of the Earth's surface, and how each segment was overlapped to produce the final image that you see up top. It's worth pointing out that four longitudinal lines of "haze" in this composite image are actually an artifact of the individual photographs themselves, and not the stitching process. According to NASA, these lines actually show the reflection of sunlight off the ocean, also known as "glint," that VIIRS imaged while orbiting the planet.